We are in the second half of the 15 weeks! I hope you'll stay with me as we finish this out because we have a lot of exciting topics coming up. But, before we get to herbs and spices, please take a minute to reach out with any questions or to share your experience with 15 Weeks of More so far. I would love to hear from you. When we think of herbs and spices, what is the first thing to come to mind? For me it's always part of the same message as reducing sodium and this is important since research points to excess sodium as a contributing risk factor for the development of chronic disease like high blood pressure and heart disease, but did you know that herbs and spices provide benefits beyond simply acting as a salt substitute? Herbs and spices are a source of antioxidants and many are considered to be functional foods meaning they provide a benefit beyond nutrition alone. Your goal this week is to try a minimum of five different types herbs and/or spices in your meals. Herbs and spices are a source of plant compounds with antioxidant activity known as phytonutrients. Some examples of phytochemicals include resveratrol and capsaicin. However, herbs and spices have hundreds, if not thousands, of phytochemicals. We are going to focus on a few common herbs and spices, but feel free to branch out and try something new this week. Be sure to tell me about it either via email or share your experience with #aneweats on Facebook or Instagram. This common spice is more than warming flavor in your oatmeal. Research shows that it may help in lowering blood sugar. Cinnamon is also known to have antioxidant activity as well as antimicrobial properties. Try cinnamon in place of sugar when looking to add more flavor to a meal such as in oatmeal, yogurt, or a smoothie. Were you told to drink ginger ale when you were sick as a kid? Turns out there might be something to that recommendation. Ginger is a root that can be consumed fresh or dried. It aids in digestion by helping with gastric mobility. Ginger also has antioxidant and anti-inflammatory properties. You can buy ginger root and easily peel it using a spoon. See demonstration here. Dried ginger root is also available wherever you buy spices. Thyme is another common herb that can be used either fresh or dried. You don't need to go to a specialty store to find it and its use is varied. Add thyme to sauces, stir-fry dishes, casseroles, soups, and even teas. It also makes for a great addition to a flavor-infused water using citrus. Thyme is a source of antioxidants and has anti-inflammatory properties. Garlic is a staple in my kitchen since it is so versatile. I use it most every meal I prepare. Garlic has potential anti-cancer properties. It might also be helpful in lowering cholesterol and blood pressure. Garlic also has anti-microbial properties. When garlic is crushed or chopped, a compound known as allicin is released and breaks down into a secondary compounds known as organosulfur compounds. These compounds may play a role in the prevention of certain cancers. I will be on social this week sharing how I'm adding more herbs and spices to my meals and providing tips for how you can do the same. Don't forget to share your tips and ideas with #aneweats. You can see more on Instagram @allisonknottrd or on Facebook on the ANEWtrition page. New here? 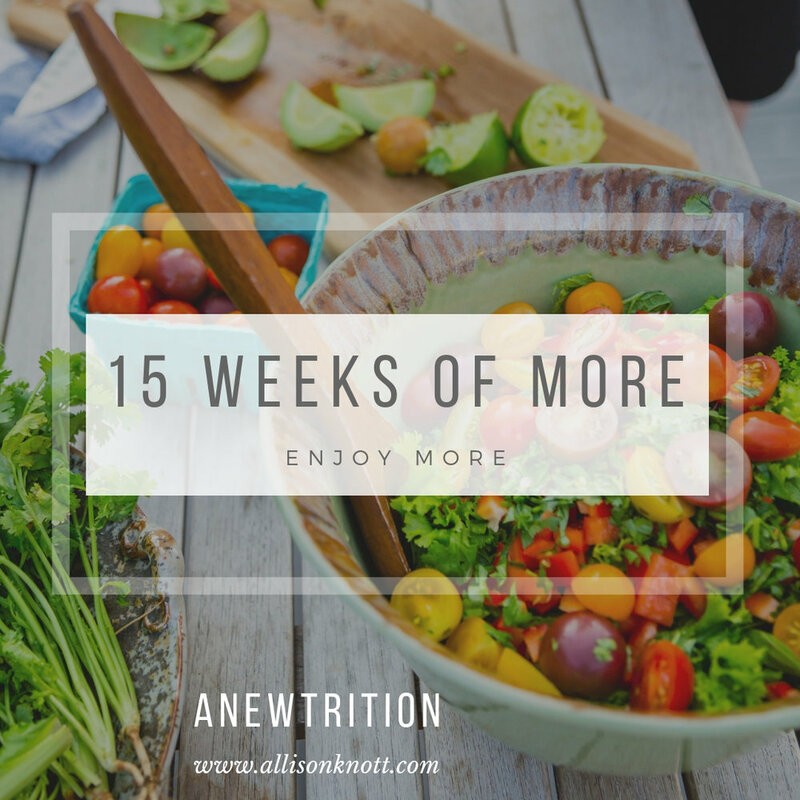 Check out the introduction to 15 Weeks of More, Week 1, Week 2, Week 3, Week 4, Week 5, Week 6, Week 7, and Week 8.